After months of hyping up her upcoming tell-all autobiography, Katie Price doesn’t seem too phased by the books latest setback. Where as this news is sure to disappoint Katie’s legion of loyal fans, she seems to be taking it all in her stride. 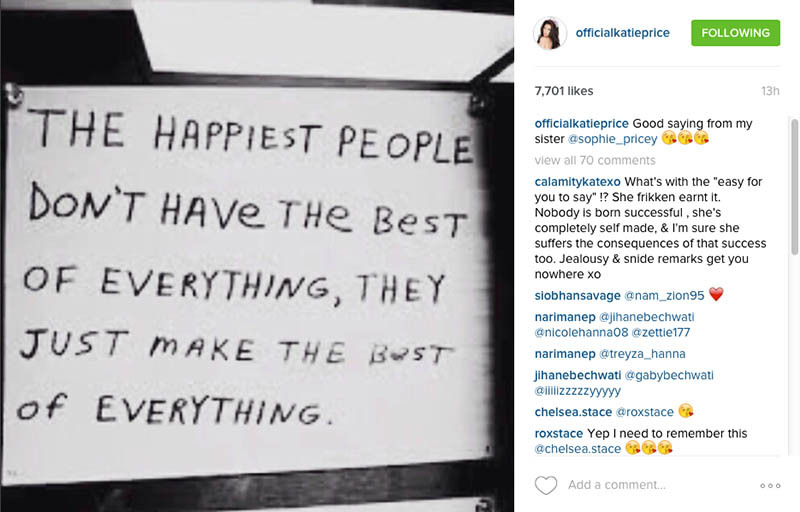 The 37-year-old businesswoman seemingly reacted to the setback by taking to Instagram to share an inspirational quote after the news broke. Does this mean Katie’s trying to make the best of a bad situation? Possibly. The star also surrounded herself by family yesterday as she shared a pool picture with her nearest and dearest. While fans may be sad about the setback, it seems they’ll be a few famous faces breathing a sigh of relief. Can we just read it now? Please and thank you.